Today, a dream. The University of Houston’s College of Engineering presents this series about the machines that make our civilization run, and the people whose ingenuity created them. In any list of history’s most influential figures, the name Johannes Kepler hovers near the top. Distinguished astronomer and mathematician, Kepler discovered the laws of planetary motion. He also wrote what many consider the very first work of science fiction. Kepler was a contemporary of Galileo. Both were advocates of the Copernican model of the solar system, with the sun, not earth, at its center — a worldview that could lead to charges of heresy. In 1593, while a student at Tübingen University, Kepler wrote a dissertation on the following question: what would it be like to stand on the moon and look at the heavens? Kepler argued that it would be much the same as on earth. To Kepler’s professor, who believed the moon and planets raced at blinding speeds around a stationary earth, the argument was absurd. Kepler was forced to shelve his work. But he didn’t abandon it. Sixteen years later and far from Tübingen, he completed an expanded version entitled the Somnium, or Dream. Recast in a dreamlike framework, Kepler felt free to probe ideas about the moon that he otherwise couldn’t. And what an imagination! Inhabitants weren’t mere recreations of terrestrial life, but entirely new forms of life adapted to lunar extremes. Large. Tough-skinned. They evoked visions of dinosaurs. Some used boats, implying not just life but intelligent, non-human life. Imagine how shocking that must have been at the time. Kepler tells the tale through the eyes of a young man who bears obvious similarities to Kepler himself. So when the story hints that the protagonist’s mother is a witch, authorities make a connection with Kepler’s real-life mother and arrest her on charges of being a witch. It didn’t help that, years before, the woman who raised Kepler’s mother had actually been burned as a witch. It took Kepler five years to have his mother released. And Kepler still wasn’t done with the Somnium. After his mother died, Kepler completed a set of explanatory footnotes which by themselves were almost three times longer than the text. He intended to publish the Somnium bound with ancient works by Plutarch and Lucian — books that both inspired Kepler’s efforts and would have lent credibility to the Somnium. Unfortunately, he died before he could realize his “Dream.” The final version of the Somnium was published shortly after his death as a stand-alone work. Exactly what Kepler intended when he wrote the Somnium isn’t altogether clear, and the work remains a bit of a puzzle. But the result, the mix of facts and enlightened dreaming, are hallmarks of classic science fiction. G. E. Christianson. “Kepler’s Somnium: Science Fiction and the Renaissance Scientist.” Science Fiction Studies, 8(3): 1976. See also the DePauw University Web site: http://www.depauw.edu/sfs/backissues/8/christianson8art.htm. Accessed May 24, 2010. J. Kepler. 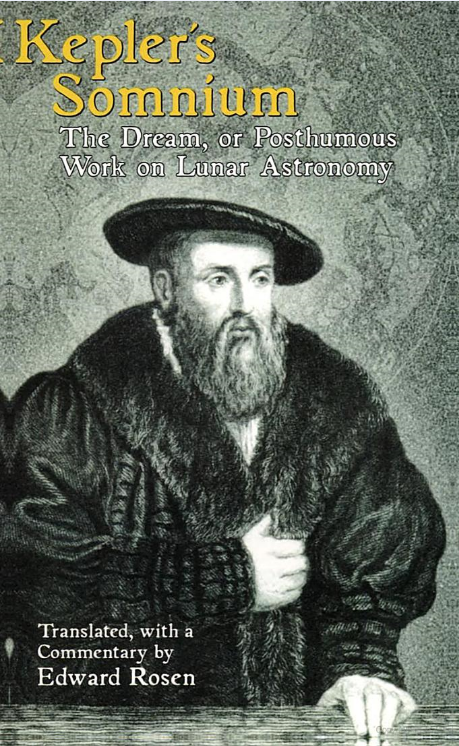 Kepler’s Somnium: The Dream, or Posthumous Work on Lunar Astronomy. E. Rosen, ed. New York: Dover, 2003. The works referred to in the episode include Plutarch’s On the Face of the Moon and Lucian’s A True Story — both quite interesting in their own right. The picture of Kepler is from the book cover of the 2003 Dover publication edited by Rosen. 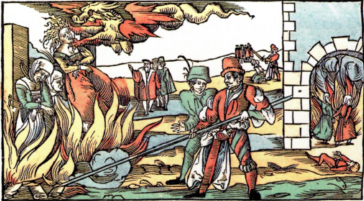 The picture of the witches burning is from Wikimedia Commons.